Fishburne Military School will make its first-ever trip to the National Prep Championships as one of the top two seeds in the eight-team field. 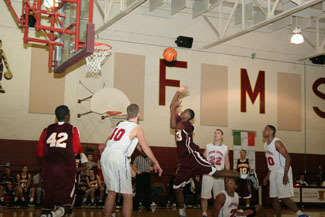 FMS (26-5) will square off with #4 seed Northfield Mount Hermon (Mass.) in the first round of the national tournament on Tuesday, March 5, at 7 p.m.
Fishburne and Northfield Mount Hermon met in November at the National Prep Showcase. The Caissons won that game by a 64-59 final. The winner of the FMS-Northfield Mount Hermon game plays the winner of the #2 Massanutten Military Academy-#3Notre Dame Prep game at 11 a.m. on Wednesday. Fishburne defeated MMA in the only regular-season matchup between the two schools in the 2012-2013 season by a 102-92 final on Jan. 11. The national-title game is set for 7 p.m. Wednesday. The top seed in the second bracket is St. Thomas More School (Conn.), which defeated Fishburne on Nov. 17 in overtime, 85-76. St. Thomas More will play #4 seed Hargrave on Tuesday. FMS and Hargrave split a season series in 2012-2013, with the Caissons getting a 109-102 win in their most recent matchup on Feb. 6.